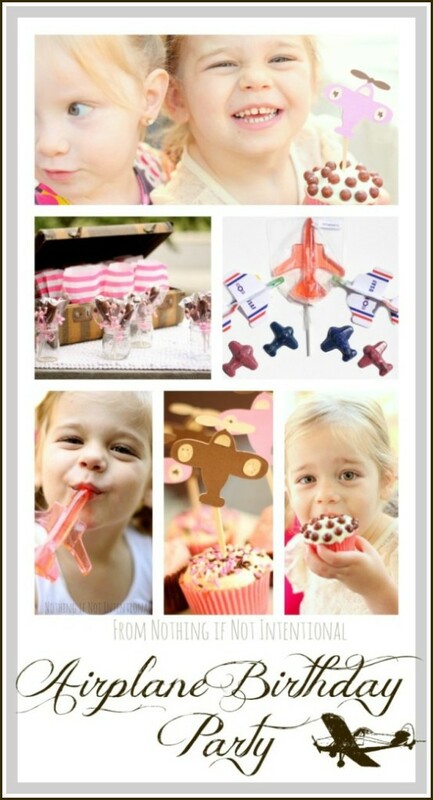 Since her future career aspiration is a great mix of gender stereotypes, we thought that a pink airplane party would be the perfect way to celebrate our firstborn daughter’s transition to three! As with our baby’s first pink lemonade and pinwheels birthday party, many of the beautiful accessories you’ll see mentioned in this post were provided by sweet and talented etsy vendors. 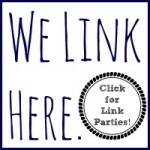 Please like, share, and pin this post so that you and your friends can find and patron their shops the next time you have a party to plan! As we were planning the big day, the birthday girl made only one request: that we make her a pink cake. You want pink cake for your birthday? You got it, kiddo! We’re (fairly) strict about sugar and dessert, but we make exceptions for birthday parties. 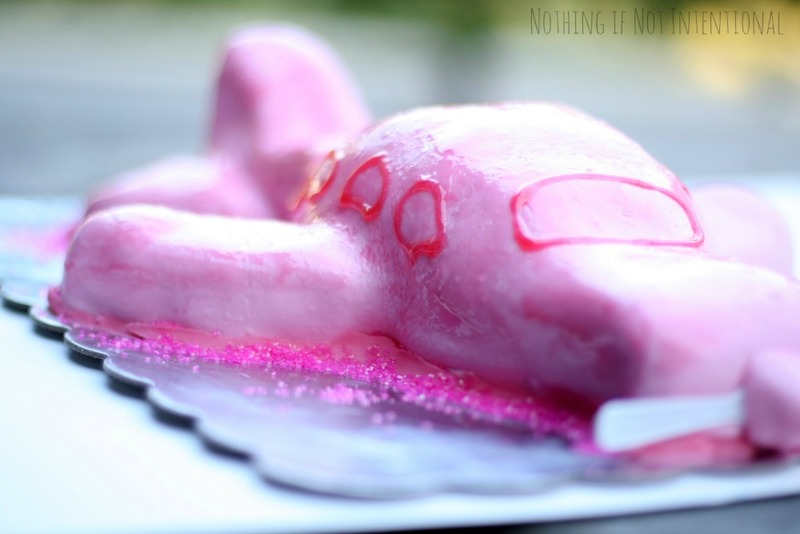 For dessert, we had chocolate airplane suckers, airplane cupcakes, and pink cake. 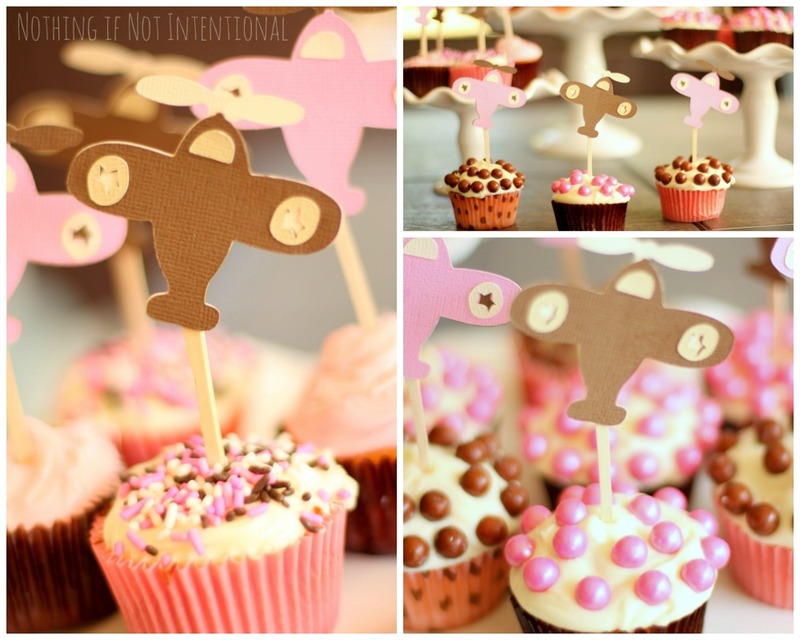 The airplane cupcake toppers from Kathy at DK Delektables were precious. Her shop stocks blue and red airplanes, but it was no problem for her to switch the planes to pink and brown. She’s also responsible for the little chocolate balls and sprinkles. Adorable, right? 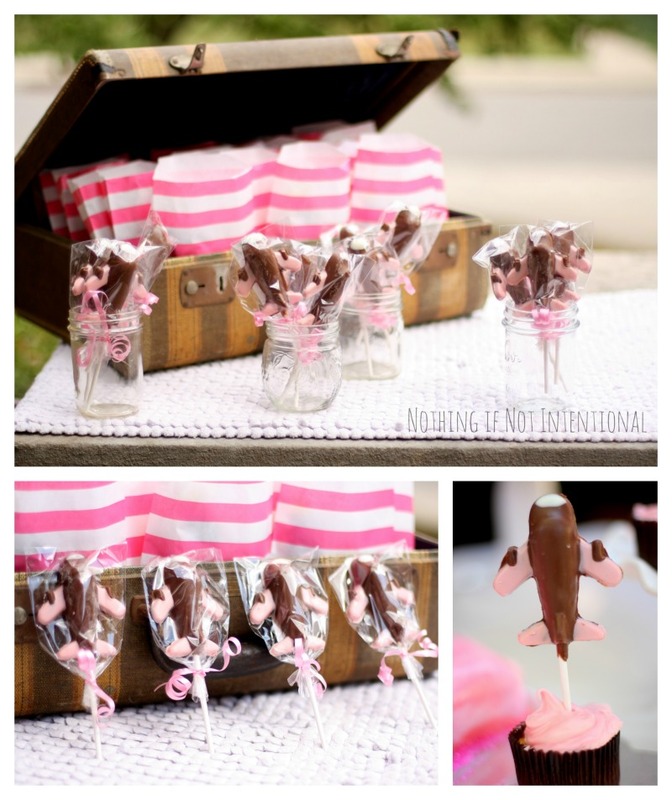 And I was thrilled to add these chocolate lollipops from SandiPopsLollies to the dessert table. Of course the kids were crazy for the airplanes! See the cake? Nate and I made it together with minimal frustration and bickering. Not too shabby, right? Especially once you know that Nate crafted the airplane shape from just two round cakes. 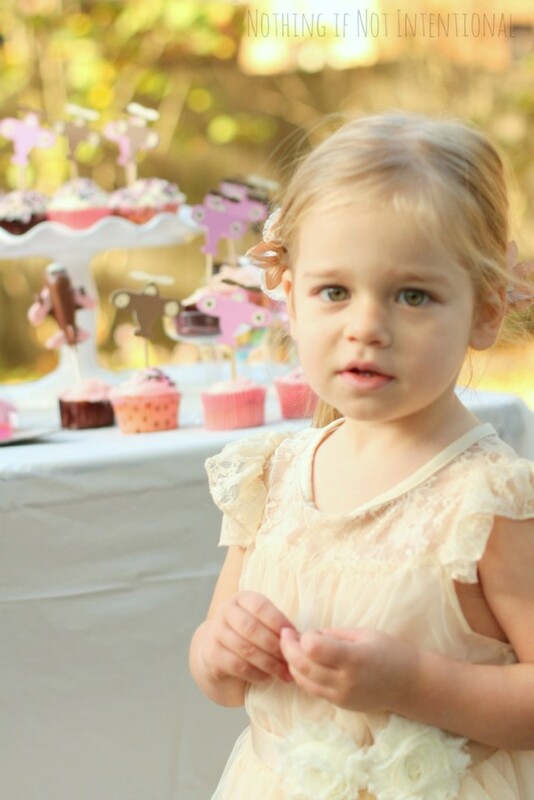 Our birthday girl solemnly guarded the cake table until Mommy gave her the okay to eat and share her sweet goodies. 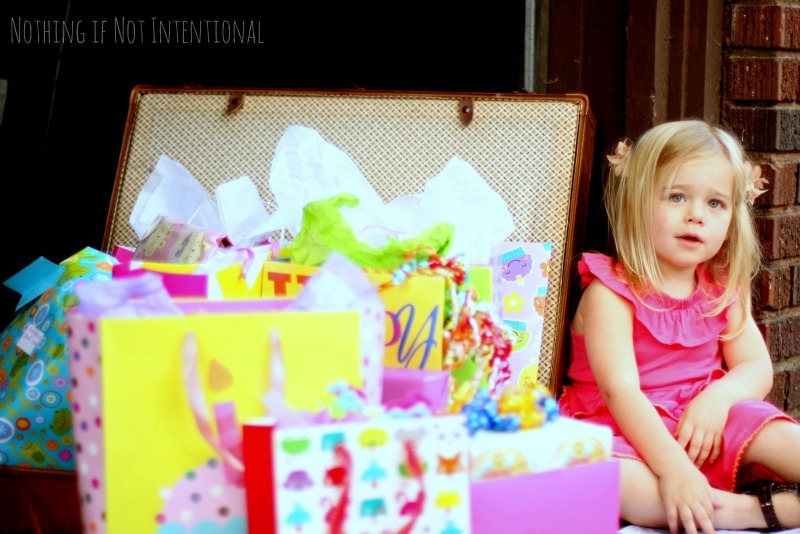 Although we NEVER want our friends to feel obligated to bring a gift (their presence truly is the best present! ), I suspected that a few people would bring gifts. We put the presents in these truly vintage suitcases. My grandpa traveled with them during WWII. They hung under a “Baggage Check-In” sign from DK Delektables and this “Welcome Aboard!” sign. The beautiful, charismatic, friendly birthday girl was truly the star of the show. Of course I wouldn’t want it any other way. 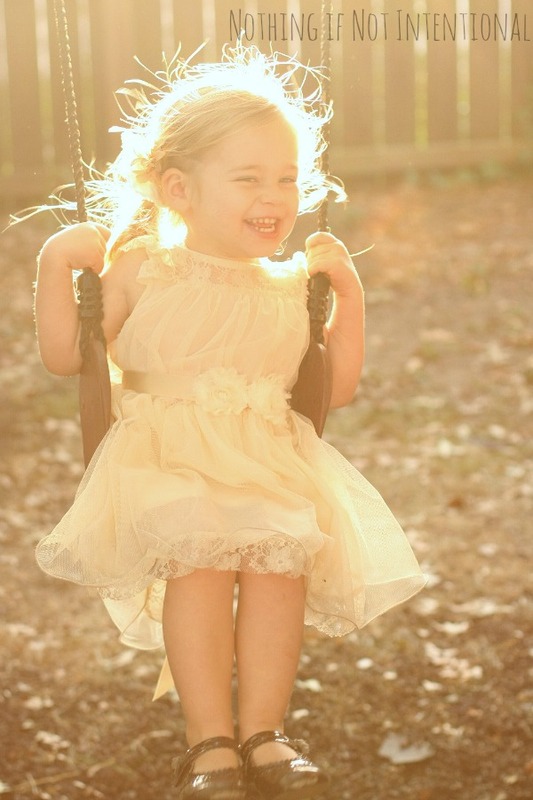 The dress (Olivia Vintage Beige Flower Girl Dress) from Kailyn Zoe and Company is stunning, wouldn’t you agree? 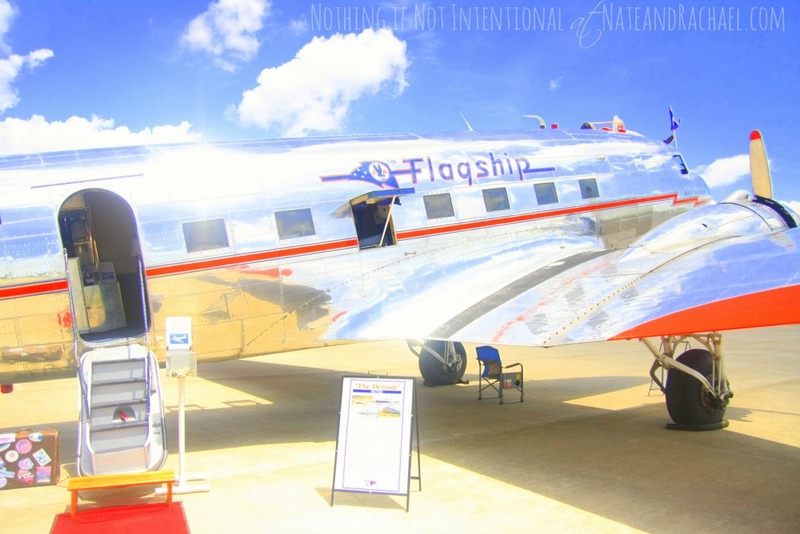 A few weeks before her party, a historic DC-3 plane (the Flagship Detroit) stopped by our local airport. While we touring the plane (of course we had to take a tour! ), we realized it was the perfect spot for an impromptu photo shoot. 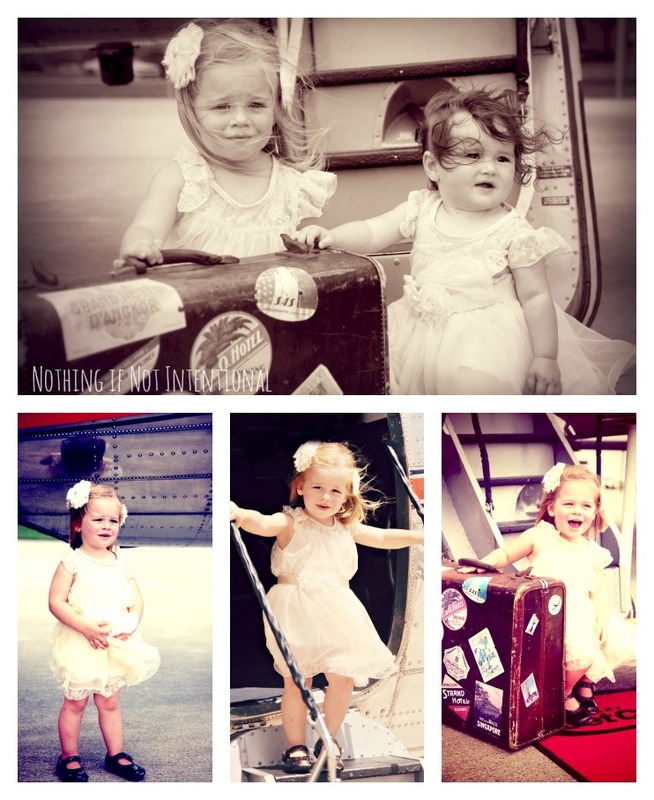 The dress + vintage plane + birthday girl + plans for a vintage plane party was a pretty amazing combination. I couldn’t call it a play date party without some play! You can read all about our fizzing airplanes, airplane sensory bin, and airplane coloring sheets in our Airplane Play post. At the end of the evening, we sent the party guests home with goodies filled with (you guessed it!) airplanes. The birthday girl loved helping me make these adorable crayons. 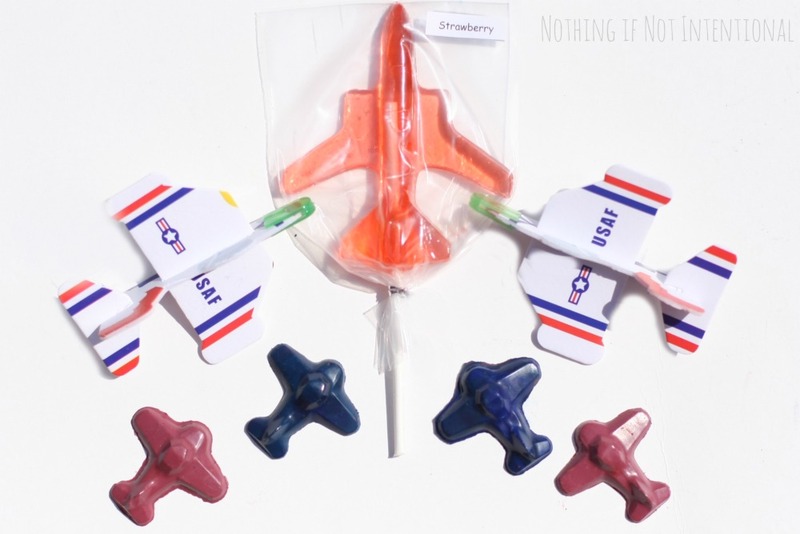 I have this post that will tell you exactly how to make your own airplane crayons. We threw in a few airplane gliders. 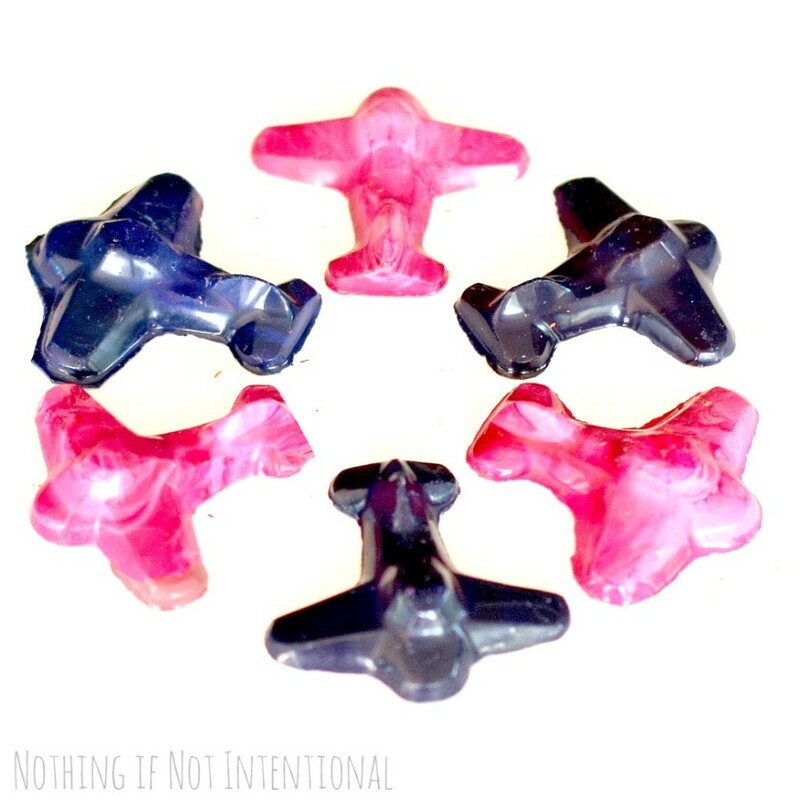 But these airplane suckers from Sherrie Core Designs were the real treat. I got to pick the color AND flavor. Is that not the coolest thing ever? For the record, I chose the strawberry and watermelon daiquiri flavors. They’re pink, made without nut extract (allergy-friendly), and delicious. All in all, I can’t imagine a more magical party for our future pilot mommy. Thanks to everyone who helped us celebrate her birthday both in person and online! Kailyn Zoe and Company–Flower girl and special occasion dresses. 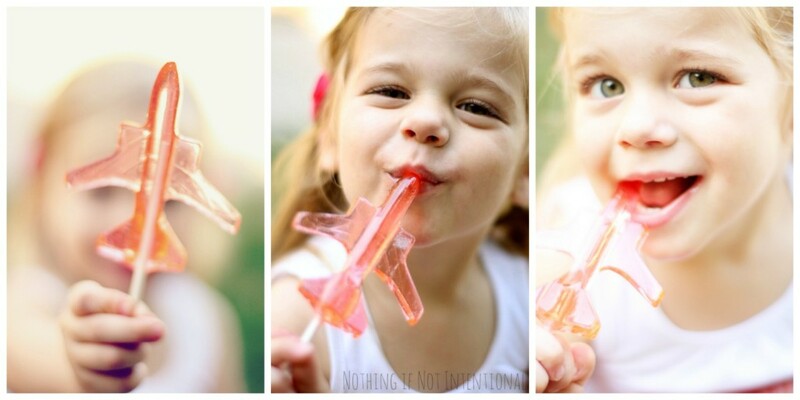 Pingback: Make your own airplane crayons. Cool! 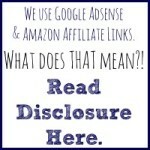 I never thought of this idea, but this seems to be a good idea! Thanks for this post. That party must be fun. 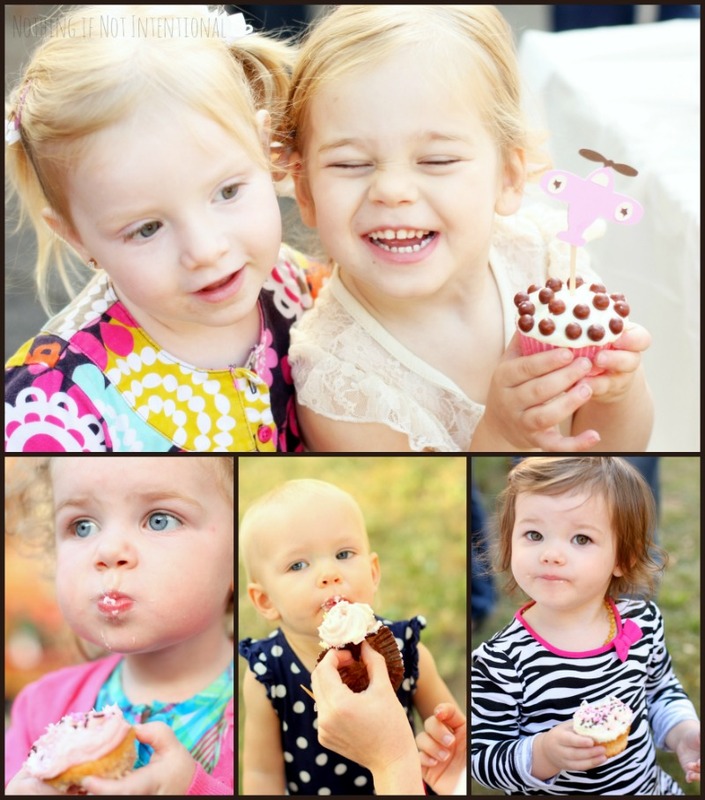 Pingback: Train Birthday Party for Boys or Girls!